You gotta have a cake! I am more interested in the bigger ideas of Scouting rather than writing about my own Troop or my individual experiences. Bear with me today as I share what’s been going on recently. April 2014 marks my 30th year as Scoutmaster and I have come to the decision that September 1, 2014 will be the date of my retirement. Our long-range plans at this writing include a trip to Kandersteg in the summer of 2014 and with your permission I would like to lead that trip as my last as Scoutmaster. Steady, stable youth membership and consistent youth leadership transitions. A lively program and tradition that is largely self- regenerating. Two years should be sufficient notice to name a replacement. I cannot serve indefinitely. I would like to see this transition made while the troop has strong, capable leadership and before retirement is absolutely necessary. I would be pleased to spend time prior to my retirement in helping train and transition our new Scoutmaster, once he or she is named, if the committee considers this would be useful. Second only to the young men, families and fellow leaders I have worked with over the years my greatest joy in Scouting has been in discovering and learning how it works. While I have leaned on many experienced Scouters for advice I have also been free to build a program without much interference or while being overshadowed by my predecessors. No doubt our next Scoutmaster will have some new ideas and directions; ones that he or she should be able to implement with the same freedoms I enjoyed. For this reason it is my intention to be on call but not be directly involved with meetings or outings for a substantial period (four to six months) after my retirement as to allow the new Scoutmaster sufficient time to become established. Afterwards I can offer to return to more active involvement if the committee and troop leadership sees fit to accept my help. I do not feel that it would be proper or advisable for me to be involved in seeking or endorsing a replacement – this is a job for the committee and our chartered organization – so I ask that I be allowed to forgo any discussions or meetings on the subject. I have complete confidence in your ability to make this change and to maintain the continued success we have all worked so hard to establish. We have had the benefit of many people continuing to serve our troop long after their son’s involvement has concluded. Indeed, I hope to continue on as an active part of Troop 24 for many years. We have lots of experienced, dedicated people but we also need to keep key positions available to new folks – we were all inexperienced when we arrived. 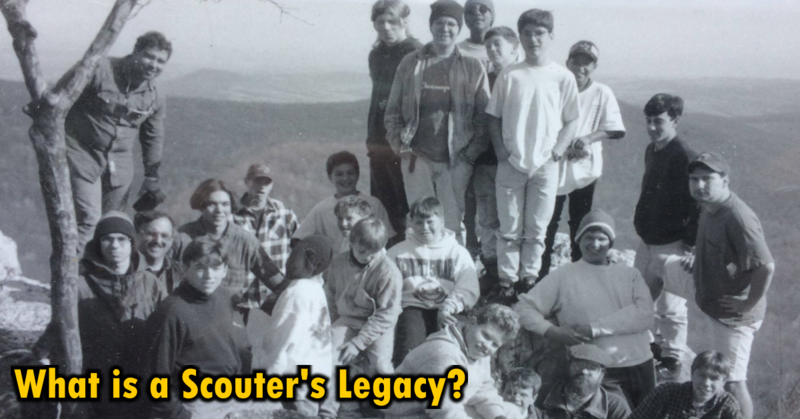 The dates and timeline laid out in this letter represent what I think is a reasonable plan – if a new Scoutmaster is, in the opinion of the committee, ready to take over prior to September 1, 2014 I will not stand in the way. Nearly two years later things have gone according to plan. It took about a year to name a new Scoutmaster, and announce the pending changes to our Scouts and their families. 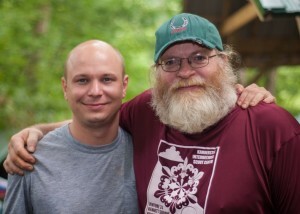 The new Scoutmaster and I have been working closely together and I have no doubt that we’ll have a smooth transition. I look forward to September when I become our Venture Crew Advisor, a new challenge! A few friends have asked how this feels, if it’s a sad or difficult time – far from it! I figure thirty years is a pretty good run and, as wonderful as the experience has been, it’s time for someone else to have all the fun. The real difficulty was arriving at the decision to retire, once I had made up my mind the rest was easy. So how did I decide? At 54 years of age I realize that I am not going to be able to do this (or anything else) forever. It’s inevitable that, someday, circumstances would require I step away whether I like it or not. I decided that I could wait for that to happen, or make a decision now. I talked hings over with my wife, my adult step-son, and some close confidants. One of the things I discussed with my wife, who has been a real partner in all of this, was the fact that the folks who would be administering the Troop may not do what we did like we did it. We discussed how we would feel if things really went south and the Troop folded: would that make everything we’ve done for naught? We arrived at the conclusion that the Troop itself isn’t our legacy, if it continues to be important to people it will go on, and what ever happens next is happily beyond our control. Our legacy is safe in the lives of the boys (now men) who we have worked with over the past few decades. Somewhere between 75-100 boys became Eagle Scouts (someday we’ll count them, I stopped keeping track years ago) and a few hundred more got to be Scouts; in the end that is all that matters. While the Venture crew will require some time it won’t be quite as demanding. I look forward to being free of the routine tasks of being a Scoutmaster and bearing the responsibilities associated with the title. 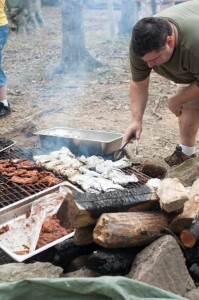 We have a long tradition of having a Thursday night feast in our campsite during our week at summer camp. 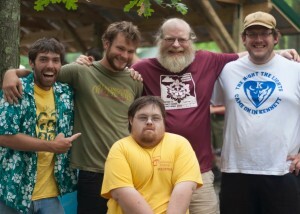 This year it became a retirement party and many of my old Scouts and fellow staff members showed up to celebrate. It was was a wonderful evening, lots of memories and stories. Here’s a few pictures of the event. Even older Scouts showed up! 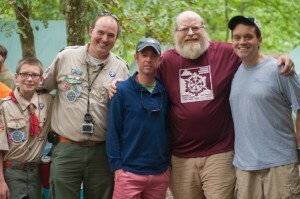 (Trip, the man to my right, was actually in my Webelos den 30 years ago! Our usual Thursday Night cookout. Mark is one old Scout I have been privileged to call a friend for the past thirty years. Friends donated towards building a new pavillion in our campsite. Linda, mother of two Scouts, committee member, Chartered Organization Representative, Scouter, and dear friend, made the whole evening possible. We all know people like her, with a heart as big as all outdoors who get things done, thank you for being who you are! I hope that you’ve already saved CrewAdvisorCG.com!!! I have to admit I got a little well… excuse me I’ve got some dust in my eyes. Congratulations! 30 years is one heck of a run! To think of all the young lives you’ve influenced. 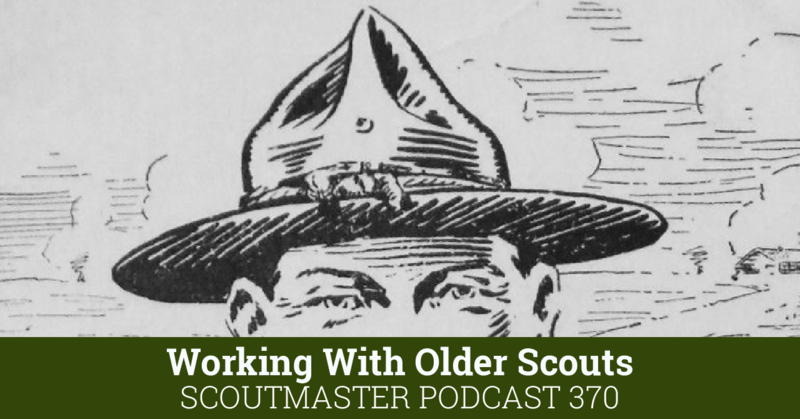 I’ve been a Scouter for almost 20 years and it never worked out that I would be a SM (Every other job but that one). Last year I had to transition from Scouter (TCC) to Venturing Advisor, I’m still an Assisstant Dist. Comm. 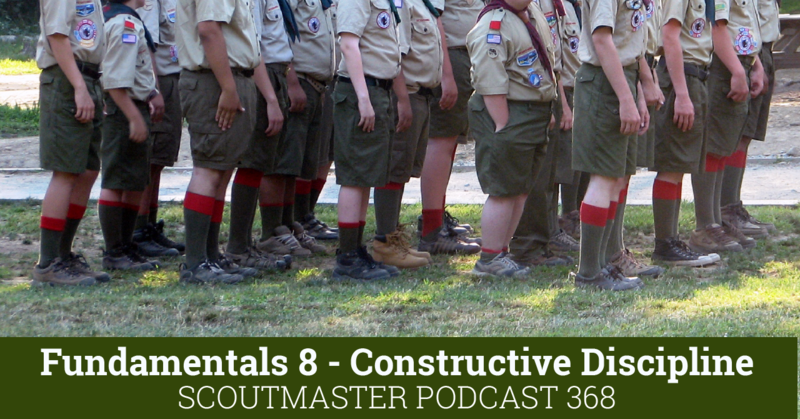 I’ve tried to explore the differences and similarities with Venturing and Boy Scouts. I look forward to discussing them with you. It’s a great time to be a Venturer! I look forward to all the new tools available to Adisor’s. Clarke, now you have time to come out and help us get the “patrol method” to work. Let me know when you get back and I’ll pick you up. Congratulations on your thirty years Clarke, and welcome to the three decade club. There are not that many of us after all. I hope you have as many great memories as I have and that you enjoy your new Scouting role. Hopefully that doesn’t mean retiring from ScoutmasterCG!! Your website provide so much that I think many of us would be sad if your postings disappeared. Enjoy the new adVENTURE in Venturing!! Congrads and best foot forward on to ventures. We have never met but i have read your blogs. I am also will be 30yrs in Scouting in2015. I am also plying with retirement. I hope the best for you Scouter Phil 34th London Canada. Well done!! 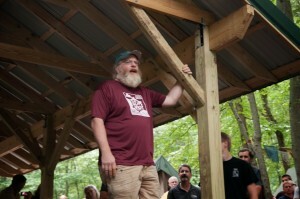 2-years ago out Troop’s Scoutmaster of 35-years decided to pass the baton. Still involved part time thankfully. Our new Scoutmaster & we ASM’s are still working out the kinks of learning to ‘BE’ Scouters, which based on all I have learned from your great work, is a never-ending lesson. I pray you’ll continue your blog. It is a real highlight of my workweek & I truly try to put all your shared wisdom to good use. Again I say well done & thanks!! Always, Yours In Scouting! 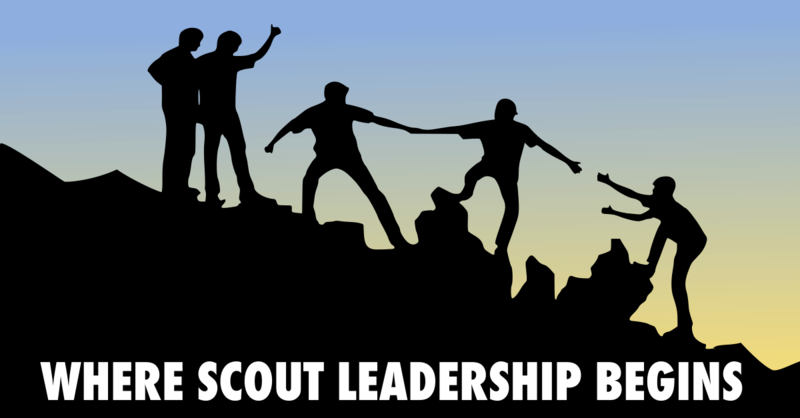 I see it not as stepping down or passing the torch, but giving someone else the opportunity to grow spiritually and experience the joys of mentoring both scouts and other adult leaders. I cannot tell you fully the influence you have had on my thoughts and actions as a scoutmaster. 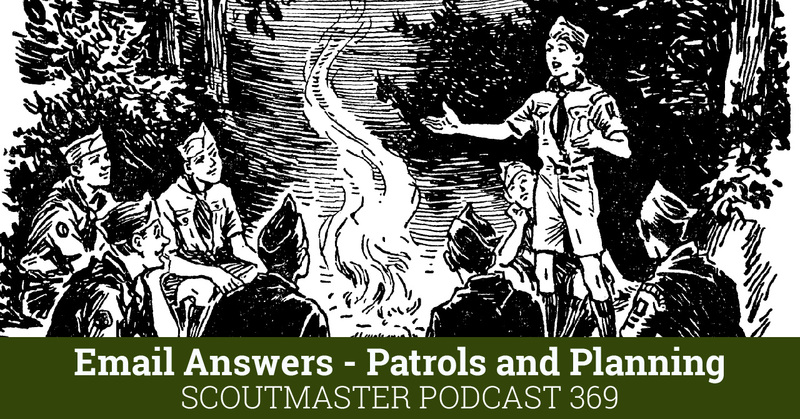 Your pod-casts and videos are great, and will figure prominently in my future training of scouters in the troop setting. Just think, now, when you go on a troop camp-out, all you have to do is sit around the camp-fire and drink coffee. And tell old war stories about scouting 30 years ago. I wish I could be there. Wow and congratulations! 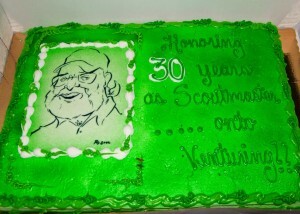 Thank you for serving the youth of BSA for 30 years. Glad to hear you are sticking around with the Venturing program. Congratulations on being brave enough to step aside. It’s hard to give up anything you have enjoyed doing to take on a new challenge. I look forward to your posts and insights into scouting be it Boy Scouts or Ventures. Congratulations, Scoutmaster Green!!! As we say in the Navy…Fair winds and following seas!